Beryllium (chemical symbol Be, atomic number 4) ranks among the lightest of all known metals. Steel-gray in color, it is strong but brittle. It is classified as an alkaline earth metal, along with calcium and magnesium. Precious forms of its mineral beryl are aquamarine and emerald. This metal, its alloys, and compounds are toxic and need to be handled with care. One needs to especially avoid inhaling their dust and vapors. Alloys of beryllium with copper or nickel are strong and wear-resistant, and are widely used in the manufacture of such items as computer parts, gyroscopes, electrodes, springs, and nonsparking tools. In addition, its alloys are useful as lightweight structural materials for high-speed aircraft, missiles, spacecraft, and satellites. The nuclear power industry uses beryllium in nuclear reactors as a neutron reflector and moderator. In X-ray lithography, beryllium is used for the reproduction of microscopic integrated circuits. Beryllium oxide is useful for applications that require an excellent heat conductor and electrical insulator, with a very high melting point and high strength and hardness. Beryllium is a significant constituent of about 100 minerals. The most important of these are beryl (Al2Be3Si6O18), bertrandite (Be4Si2O7(OH)2), chrysoberyl (Al2BeO4), and phenakite (Be2SiO4). Precious forms of beryl are aquamarine and emerald. The main commercial sources of beryllium and its compounds are beryl and bertrandite. Beryllium metal did not become readily available until 1957. Currently, the chief method of production is by reducing beryllium fluoride with magnesium metal. The chemical reaction can be written in terms of the following equation. The name beryllium comes from the Greek word beryllos, for "beryl." That, in turn, can be traced back to the Prakrit veruliya, from Pāli veuriya. These words appear akin to the Tamil veliru or vilar, meaning "to whiten, become pale." At one time, beryllium was referred to as glucinium (from the Greek word glykys, meaning "sweet"), based on the sweet taste of its salts. Beryllium was discovered by Louis Vauquelin in 1798, as the oxide in beryl and emeralds. In 1828, Friedrich Wöhler and Antoine Bussy independently isolated the metal by reacting potassium with beryllium chloride. Beryllium is a member of the family of alkaline earth metals and lies at the top of group two (former group 2A) of the periodic table, just above magnesium. In addition, it is situated in period two, between lithium and boron. Among the light metals, beryllium has one of the highest melting points. Its modulus of elasticity (a measure of its elasticity) is approximately one-third more than that of steel. It is nonmagnetic and an excellent conductor of heat. The speed of sound in beryllium is about 12,500 meters per second—greater than that through any other element. Highly permeable to X-rays, it liberates neutrons when struck by alpha particles. Beryllium resists attack by concentrated nitric acid. In addition, at standard temperature and pressure (0°C, 100 kPa), it resists oxidation when exposed to air. It appears, however, that its ability to scratch glass may be due to the formation of a thin layer of its oxide. Beryllium has ten isotopes, of which only 9Be is stable. The isotope 10Be is produced in the atmosphere by the impact of cosmic rays on oxygen and nitrogen. This beryllium (being soluble in water at pH below 5.5) readily dissolves in rainwater (which generally has a pH less than five) and is transported to the Earth's surface. As this water quickly becomes more alkaline, 10Be drops out of solution and accumulates at the soil surface. Given its half-life of 1.51 million years, 10Be has a long residence time before it decays to 10B (an isotope of boron). The isotope 10Be and its daughter products have therefore been used to examine soil erosion, soil formation from regolith, and the development of lateritic soils. It has also been used to check variations in solar activity and the age of ice cores. The instability of the isotopes 7Be and 8Be has profound consequences for cosmological theory. It means that elements heavier than beryllium could not have been produced by nuclear fusion at the time of the Big Bang. Moreover, the nuclear energy levels of 8Be are such that carbon can be produced within stars, thus making it possible for the eventual development of living organisms. The shortest-lived isotope of beryllium is 13Be, which has a half-life of 2.7 × 10-21 seconds and decays through neutron emission. The isotope 6Be also is also very short-lived, with a half-life of 5.0 × 10-21 seconds. 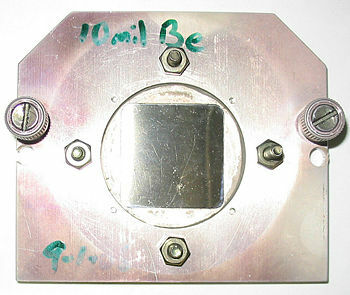 A square beryllium foil mounted in a steel case is ready to be used as a window between a vacuum chamber and an X-ray microscope. Beryllium filters out visible light but is highly transparent to X-rays. Beryllium-copper alloys (containing about two percent beryllium) are strong, hard, wear-resistant, and good conductors of heat and electricity. They are useful for gyroscopes, computer parts, and instruments requiring such properties. The alloy with nickel (98 percent nickel, two percent beryllium) is used in the manufacture of spot-welding electrodes, springs, and nonsparking tools. In addition, beryllium alloys are used by the defense and aerospace industries in the production of lightweight structural materials for high-speed aircraft, missiles, space vehicles, and communication satellites. Thin sheets of beryllium foil are used with X-ray detection diagnostics, as the foil can filter out visible light and allow only X-rays to pass through. In the field of X-ray lithography, beryllium is used for the reproduction of microscopic integrated circuits. In the telecommunications industry, beryllium is made into tools that can be safely used for tuning the highly magnetic klystrons (specialized vacuum tubes) employed in high-power microwave transmissions. The nuclear power industry uses this metal in nuclear reactors as a neutron reflector and moderator. Beryllium is used in nuclear weapons for similar reasons. For example, the critical mass of a plutonium sphere is significantly reduced if the plutonium is surrounded by a beryllium shell. Beryllium is sometimes used in neutron sources, in which the beryllium is mixed with an alpha emitter such as 210Po, 226Ra, 239Pu, or 241Am. Beryllium is also used in making gyroscopes and various computer components, where lightweight materials with rigidity and dimensional stability are needed. Beryllium oxide is useful for applications that require an excellent heat conductor and electrical insulator, with a very high melting point and high strength and hardness. Beryllium, its alloys, and its salts are toxic, and one should especially avoid inhaling their dust and fumes. Exposure to these materials can lead to two types of conditions: acute beryllium disease (acute berylliosis) and chronic beryllium disease (chronic berylliosis). In addition, long-term exposure can increase the risk of developing lung cancer. An acute condition is that which develops after a short, heavy exposure and lasts for no more than a year. Depending on the type of exposure, acute beryllium disease may involve inflammation of the skin (contact dermatitis), nose and throat (nasopharyngitis), windpipe (tracheobronchitis), or lungs (pneumonitis). Chronic beryllium disease develops after prolonged (months or years) of exposure to beryllium. The time lapse between first exposure and symptoms of the disease may be as much as ten to 15 years. The chronic disease affects mainly the lungs but its effects may also be seen in other organs. The condition produces lesions and granulomas (tissue masses) mainly in the lungs, but it may also affect other organs, such as the skin, liver, kidney, heart, bone, lymphatic system, and nervous system. Symptoms of the chronic disease include coughing, chest pain, and breathing difficulties. Acute chemical pneumonitis was first reported in Europe in 1933 and in the United States in 1943. Cases of chronic berylliosis were first described in 1946 among workers in plants manufacturing fluorescent lamps in Massachusetts, and the use of beryllium compounds in fluorescent lighting tubes was discontinued in 1949. The potential for exposure to beryllium exists in the nuclear and aerospace industries, the refining of beryllium metal, melting of beryllium-containing alloys, the manufacture of electronic devices, and the handling of other beryllium-containing materials. Early researchers tasted beryllium and its various compounds for sweetness, to verify its presence. Modern diagnostic equipment no longer necessitates this highly risky procedure, and no attempt should be made to ingest this substance. Beryllium and its compounds should be handled with great care, and special precautions must be taken when carrying out any activity that may involve the release of beryllium dust. No attempt should be made to work with beryllium before familiarization with correct handling procedures. A successful test for beryllium on different surface areas has been recently developed. This technique, in which beryllium is bound to a fluorescent chemical (sulfonated hydroxybenzoquinoline), enables the detection of beryllium at concentrations up to ten times below the recommended limit for the workplace. Typical levels of beryllium that industries may release into the air are on the order of 0.01 micrograms per cubic meter (µg/m³), averaged over a 30-day period, or two µg/m³ of workroom air for an eight-hour work shift. The current U.S. Occupational Safety and Health Administration (OSHA) permissible exposure limit for beryllium is two µg/m³, but this figure has been challenged as inadequate for protecting workers from developing beryllium sensitization and CBD. The American Conference of Governmental Industrial Hygienists (ACGIH), an independent organization of experts in the field of occupational health, has proposed a threshold limit value (TLV) of 0.05 µg/m³, in a 2006 Notice of Intended Change (NIC). As it can be difficult to control industrial exposures to beryllium, it is advisable to use any methods possible to reduce airborne and surface contamination by beryllium, to minimize the use of beryllium and beryllium-containing alloys whenever possible, and to educate people about the potential hazards if they are likely to encounter beryllium dust or fumes. ↑ American Heritage Dictionary, fourth edition, 2000 Retrieved January 30, 2008. ↑ Canadian Centre for Occupational Health and Safety: Beryllium Disease Retrieved January 30, 2008. Burrell, A.K., D.S. Ehler, T.M. McClesky, E.M. Minogue, and T.P. Taylor. Development of a New Fluorescence Method for the Detection of Beryllium on Surfaces. Journal of ASTM International (JAI). 2005. Vol 2: Issue 9. JAI Retrieved January 30, 2008. Canadian Centre for Occupational Health and Safety: Beryllium Disease Retrieved January 30, 2008. Infante P.F., and L.S. Newman. Commentary: Beryllium exposure and Chronic Beryllium Disease. Lancet 2004, 415-16. Kelleher, P.C., J.W. Martyny, M.M. Mroz, L.A. Maier, J.A. Ruttenber, D.A.Young, and L.S. Newman. Beryllium particulate exposure and disease relations in a beryllium machining plant. J Occup Environ Med 2001; 43: 238-249. Los Alamos National Laboratory – Beryllium Retrieved January 30, 2008. Mroz, M.M., R. Balkissoon, and L.S. Newman. Beryllium. ‘’Patty’s Toxicology’’, Fifth Edition. New York: John Wiley & Sons, 2001. Newman, L.S. Beryllium. Chemical & Engineering News, 2003, 36:38. USGS: Beryllium Statistics and Information Retrieved January 30, 2008. This page was last modified on 3 June 2016, at 16:39.